Let us announce you about the latest achievement of cyber security community. 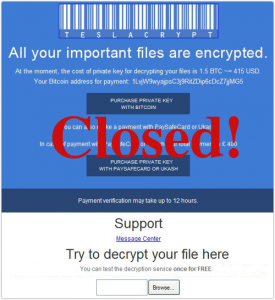 Thanks to its constant fight against the developers of TeslaCrypt, the gang working behind this virus decided to stop its distribution. What can you do if you are affected? If you are infected with ccc virus or Teslacrypt, you need to remove malicious files from the system first. To unlock your data, you should enter this Master Decryption key: 440A241DD80FCC5664E861989DB716E08CE627D8D40C7EA360AE855C727A49EE.